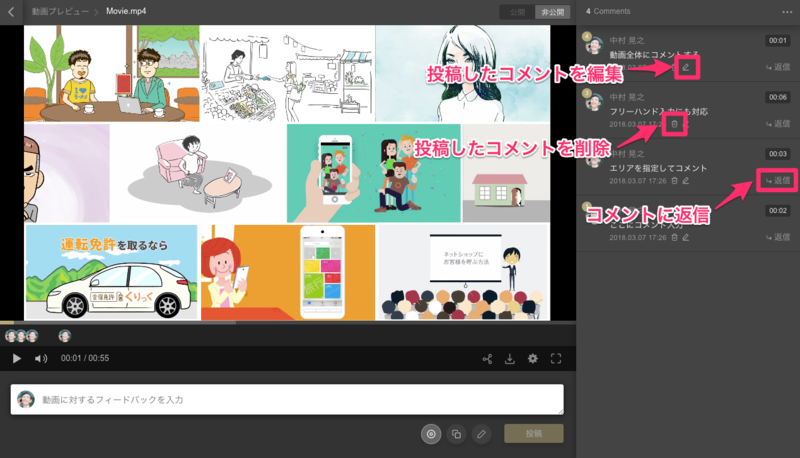 This article explains how to share videos with Collet users. 1.Open the "PROJECTS" and choose the project you want to upload videos. 3.Choose "Upload a file" or "Create directory" from a button "Add". 4.Add the video by drag and drop or choosing the video from the files. *If you only want certain users to be able view this content, create a new folder and set the viewing permissions. You can add comments on the video you uploaded. 1.Pause the video you want to leave a comment . 2.Click the part you want to leave a comment. *Choose a way of comment, "Maker", "Rectangle", "Free draw". 3.Type a comment in the text box and click "POST" at the bottom of the window. 1.Type a comment in the text box under the video. 2.Click "POST" after typing a comment. You can do the operations below for comments. You can restrict access to this file by creating a folder and choosing members you want to share with. You can also change the permissions in the folder. You can do operations below for the videos you uploaded. 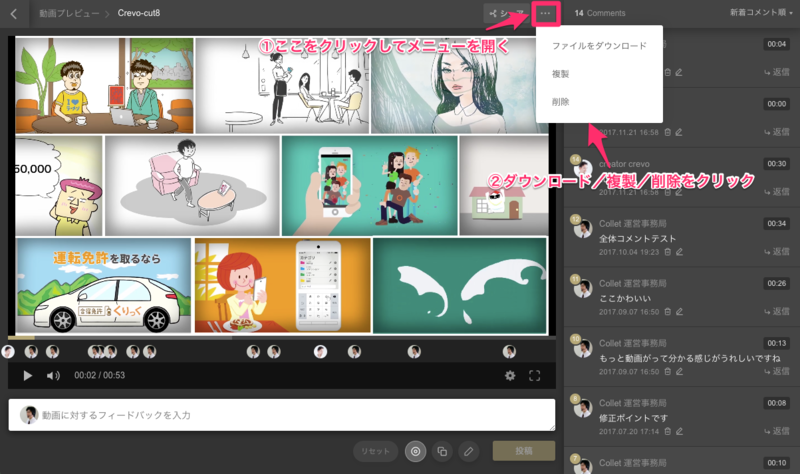 You can share videos to non-Collet users by creating shared link.